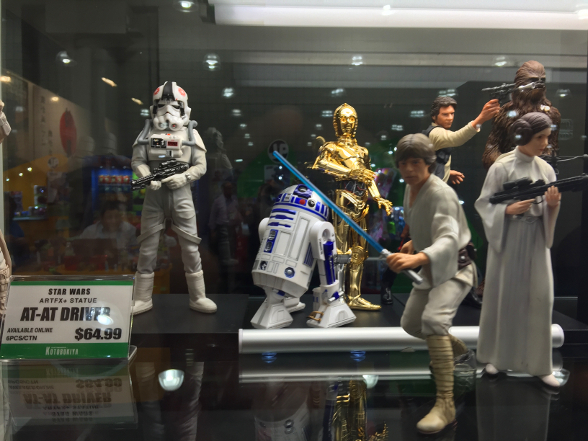 Recurring SWCA blog guest star Yehuda Kleinman attended the recent Toy Fair in New York and is here to break down the story on all things Star Wars for 2016. 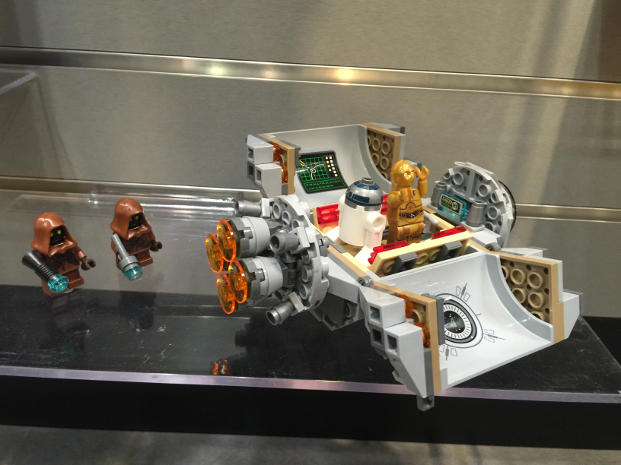 LEGO's homage to the 'Chive Cast in its "Droid Escape Pod"
Toy Fair 2015 was all about whispers and rumors of the upcoming new chapter in the Star Wars saga The Force Awakens, which would be coming out in December. Despite loving said whispers and rumors, there was very little merchandise to be shown and reviewed at that early stage due to the intense secrecy kept around the film's story line and characters. 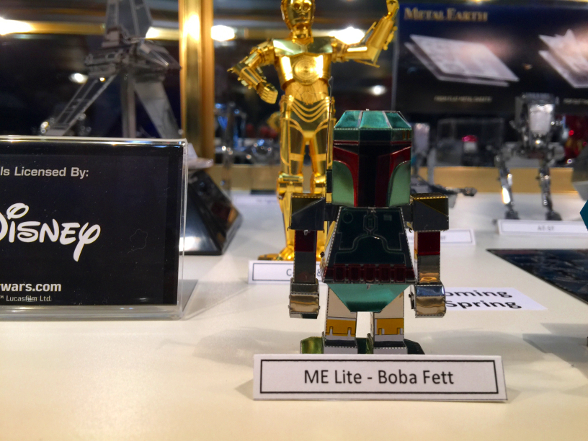 Fast forward to this year's event, and every vendor that has a license to produce Star Wars toys (and even some that didn't) had Star Wars merchandise in every shape and form as far as the eye could see. The gossip and murmurs were still around, only this time following the first "anthology" chapter of the Star Wars saga coming out at the end of the year entitled Rogue One. I'll take you through some of the most notable and interesting vendors and their products that are either just out or coming out this year. Hasbro has taken the challenge of Star Wars toy production to the next level this year. There were good to excellent representations of the characters and vehicles from the new film carefully packaged in the same way with characters from the prior films. This allows simultaneous play throughout all of the films with similar feeling toys that work well together. They are also sculpted in a fashion that is more true to form than we have seen in the recent past, with less articulation and exaggerated features. There are representations in the classic 3 3/4" line for play and collecting as well as diecast smaller scale ships and larger scale 6" figures geared more towards adult collectors. 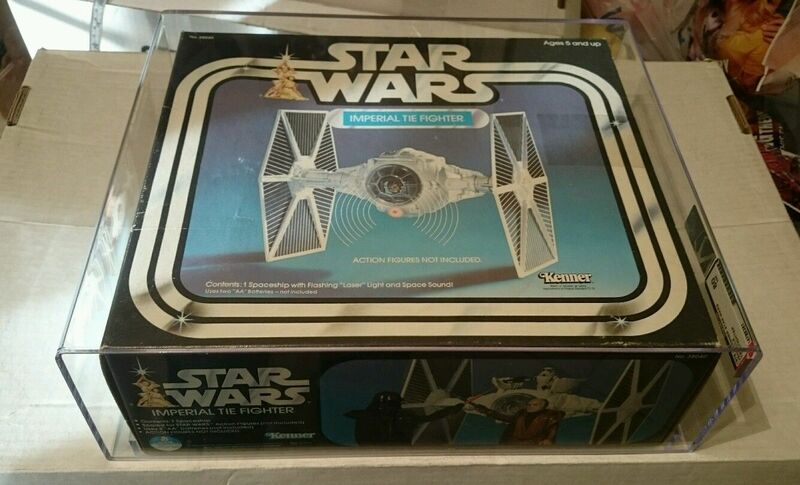 Hasbro has also embraced other classic 80s board games and toy lines with a refreshing Star Wars flair. 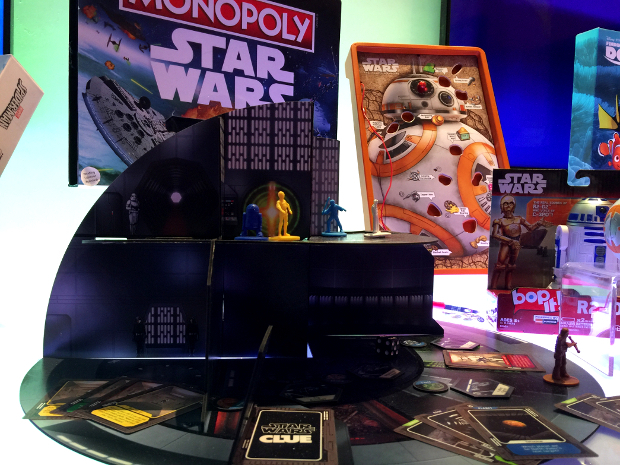 I was particularly impressed by the Star Wars version of "Clue" that was presented. It's played like the classic "Clue" game in three-dimensional form on a Death Star. They also offered a fantastic BB-8 "Operation" game. 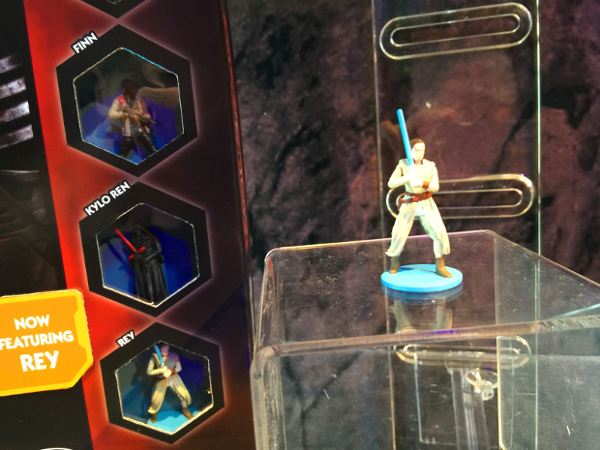 The new version of the Star Wars: The Force Awakens Monopoly game prominently featured its new Rey figure which was very vocally missed by many fans when the game was initially released without it. LEGO continues to grow and license nearly all known major pop culture phenomena of the last half century, creating building toys at an astounding rate with detailed variation. 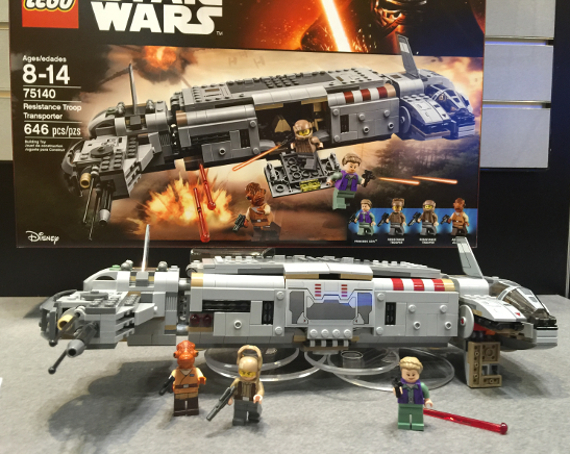 For Star Wars this year, LEGO had an expansive display of new building toys for The Force Awakens as well as adding new building toys for the original films, just as Hasbro has been doing. 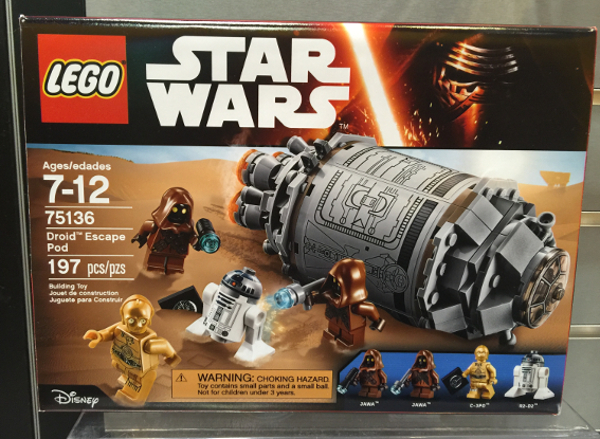 My favorite of the new offerings is their "Droid Escape Pod." It's a fun small sized building set which includes both R2 and 3PO with two scavenging Jawas. LEGO also offered an array of large sized figures which again were far more detailed in the larger scale for the collector who wants to make a more imposing display. Here is a nice example of a set from the new film depicting the new General Leia figure with her transport ship and Resistance entourage. Exclusive First Look at Revell's Master Series of Models! 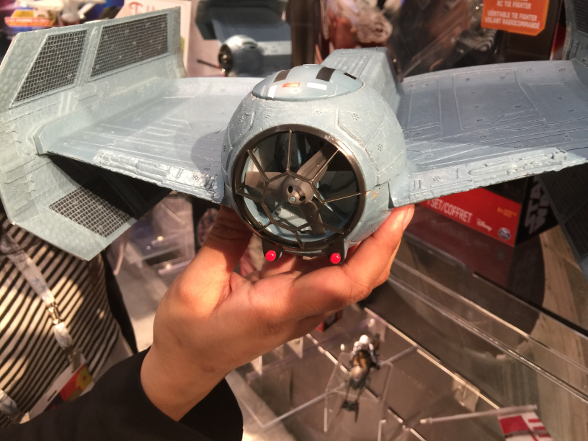 Revell Reveals More The Force Awakens Models! The beginner sets can be snapped together by nearly anyone of any age and have a durability that allow them to be played with. 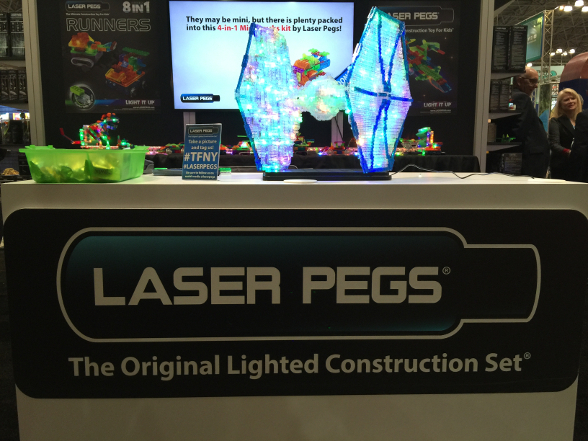 They even include working features such as lights and sound. At the other end of the skill spectrum, Revell presents the extremely complex Master sets which when assembled, visually rival ILM props. Again always thinking ahead, they were one of the few companies who did their best to hint at what was coming for Rogue One -- within the constraints of Disney's now even stricter secrecy guidelines. 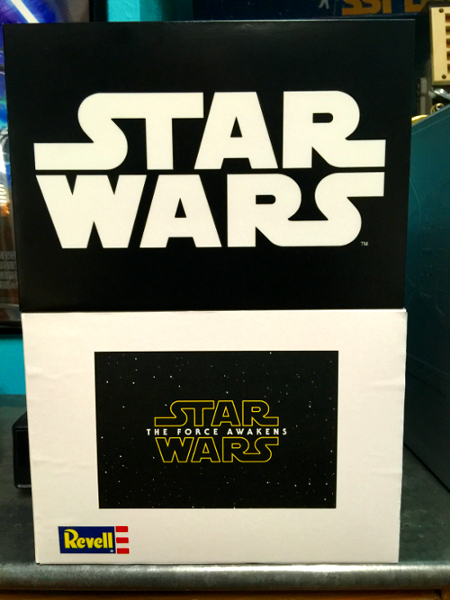 As they had done last year for The Force Awakens, they once again made mock-up boxes with no graphics or information on the box as a teaser for their new models that are being produced for the next film. This year however, the company was not allowed to add the new film's title to the mock-up boxes. So they simply say "Star Wars" with the classic logo on a black background. The sales team were still more than happy to explain what the minimalist boxes represented to anybody who asked! Metal Earth has continued to revolutionize building toys with their amazingly detailed and accurate laser printed models. 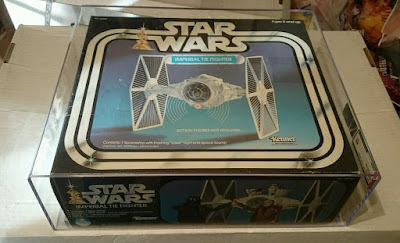 For those unfamiliar with their product line, they produce a tremendous selection of varying models from multiple properties, including Star Wars. Each set consists of two sheets of metal which have been laser cut with detailed parts that can be relatively easily removed and assembled into striking models using tweezers or needle nose pliers. 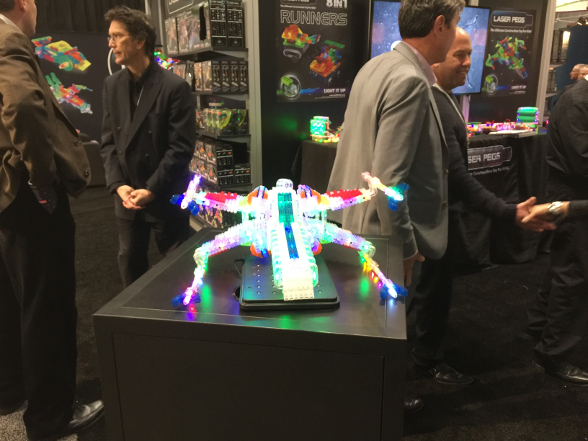 Metal Earth's new innovation this year was creating kits which had multiple colored metal parts on the same metal sheet. They will also be producing a large sized line likely later this year. 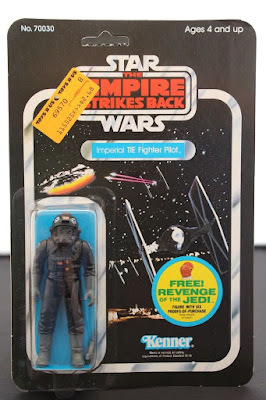 Building toy companies who were not lucky enough to obtain a license from Disney to produce Star Wars toys were not put off by demonstrating their product in a Star Wars fashion. 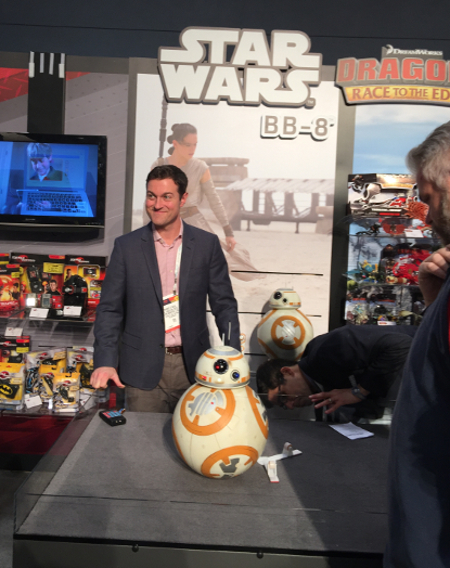 Sphero had the most successful launch of a Star Wars product last year with its remote controlled BB-8 toy which interfaced with the user's smart phone. 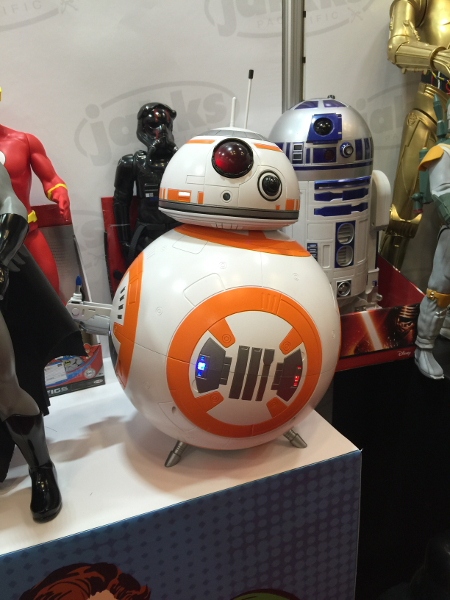 This year the company has updated the product with a more worn-looking BB-8 as well as the launch of a new wristband which can independently control BB-8 without the use of a smart phone. 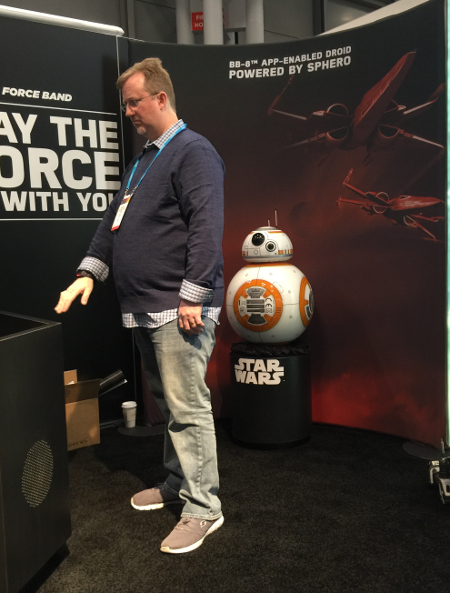 Below is a picture of a Sphero salesman demonstrating the new "Force" wristband which is now only in a prototype stage as a black band, but when at retail will have a nice droid-like appearance. Spin Master -- a company famous for its Air Hogs line of remote controlled vehicles -- made their entry this year with their own version of a remote controlled BB-8. The Spin Master approach was to make a near life-sized version of the droid that would be voice activated and function as close to the movie version as possible. The toy is quite impressive and when it was demonstrated, it did follow voice commands with relative ease and was quite interactive with the audience. However, it still remains about 7 to 8 inches smaller than the actual BB-8 prop in order to fit on toy shelves and remain cost-effective. Spin Master also presented a fantastic line of their Star Wars remote controlled vehicles, including the TIE Fighter pictured below which has its engine placed just behind the cockpit so that when in flight, it appears to have no significant human technology making it function. Jakks Pacific deserves a mention for their BB-8 model which, although not remote controlled, has fantastic features including lights, sounds, and a pop-out lighter to reproduce the droid's famous scene when he returns Finn's "thumbs up." 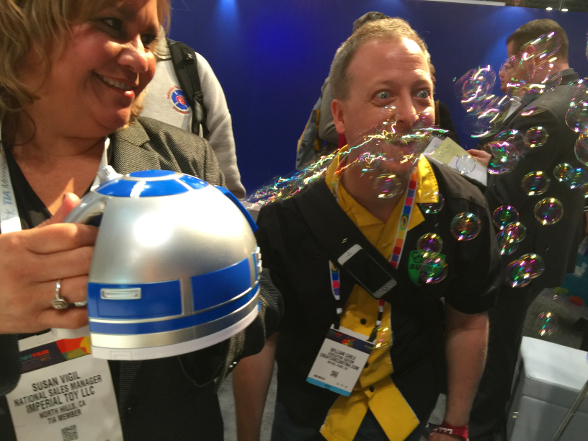 Imperial Toy followed up its successful launch of their R2-D2 bubble blowing toy with a handheld R2-D2 bubble gun, among other bubble toys that mesmerized the assembled audience. Uncle Milton -- a science-based toy company most famous for its toy ant farms -- has had several successful and fun Star Wars toys in the past including the "Force Trainer" and "Force Trainer 2" which allows the user to train with the Force through a virtual reality simulator. 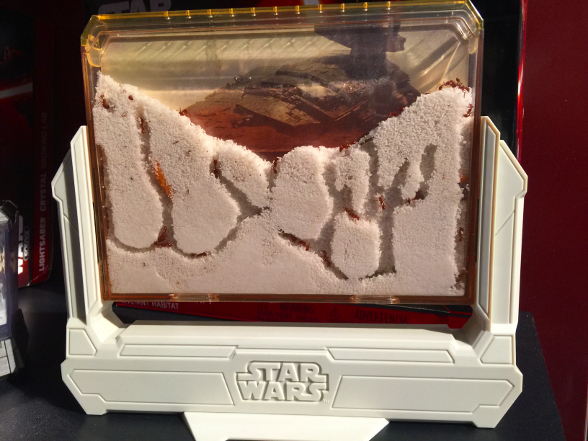 I really enjoyed their entry of a Star Wars ant farm this year. It's a bit of a stretch, but maybe they were trying to capture the essence of Geonosis? 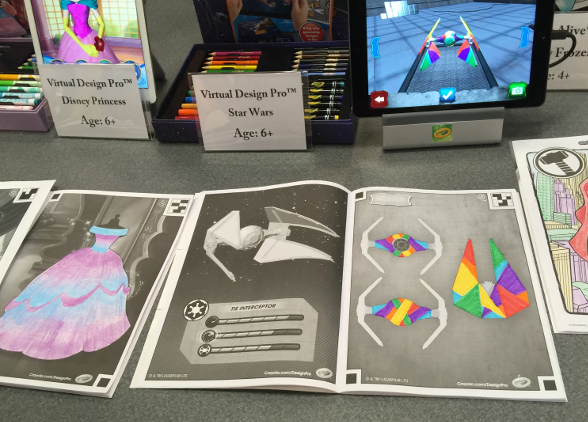 The Crayola booth displayed a unique new product, "Virtual Design Pro," which allows the user to manually color and customize different Star Wars ships and then watch them come to life on a computer screen through an interface. The toy is a nice combination of manual dexterity art mixed with new generation computer art. 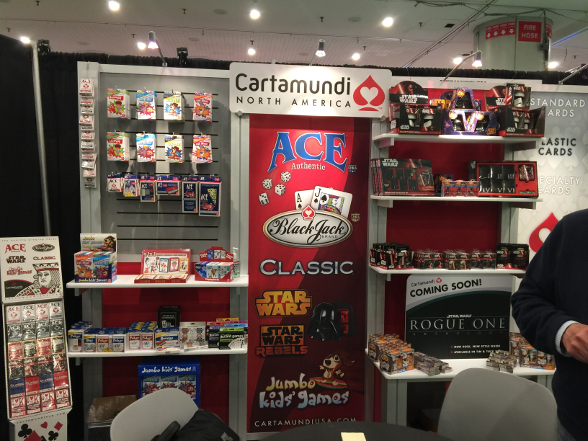 The Rouge One sign in the lower right of the Cartamundi booth (makers of Star Wars playing cards) was placed out in error with an earlier (now changed) Rogue One movie logo. The salesman stated that the reason more signs were not seen at Toy Fair carrying the Rouge One title is due to the fact that Disney has not as of yet finalized the movie's logo. 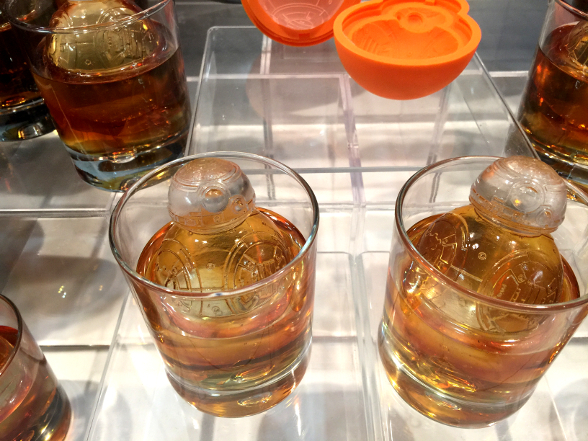 Kotobukiya -- known for its clever and well made Star Wars home goods -- premiered its new ice cube tray which makes perfectly sculpted BB-8 ice cubes. 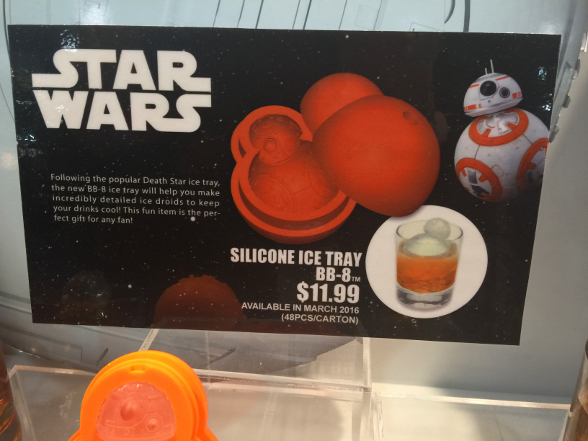 This product is an offshoot of their very successful Death Star ice cube tray, but I think the BB-8 version is even better. Also pictured are their highly detailed figures which display quite nicely. For all of our bootleg collectors, fear not! 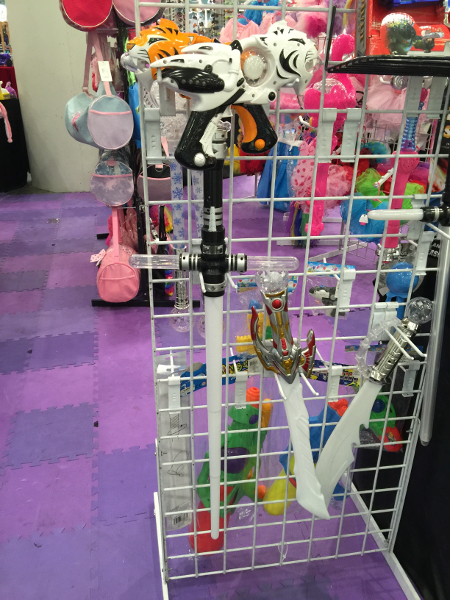 Even at Toy Fair there are plenty to be found, such as this take on the Kylo Ren tri-blade lightsaber. 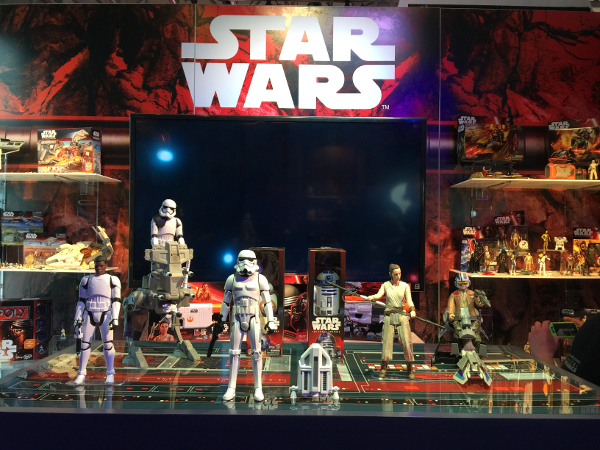 The other Star Wars news at Toy Fair was Mattel's possible future merger with Hasbro. 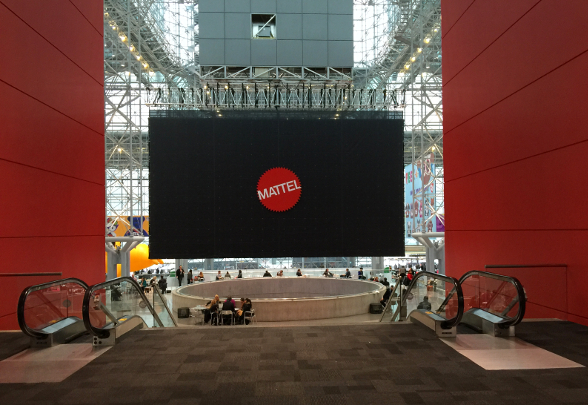 Mattel is the second largest toy producer in the world -- only second to LEGO. While a distant second, the company is significantly ahead of Hasbro. Up until this point, Mattel has been a minor player in the production of Star Wars toys, primarily focused on their license for Star Wars Hot Wheels. 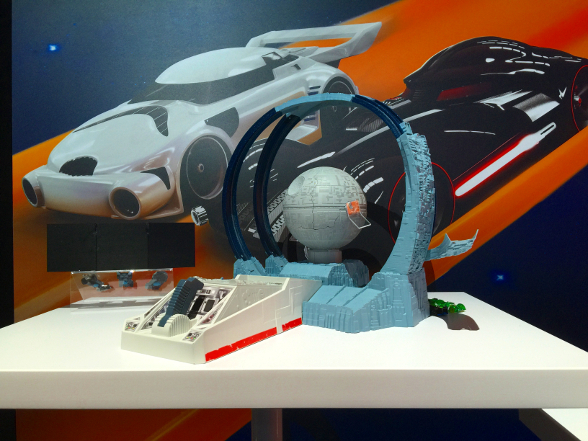 Below is a hardcopy for their latest Hot Wheels Star Wars track which actually looks kind of cool. If the merger goes through, the two major producers of Star Wars toys will be LEGO and Mattel, giving way to a whole new phase in the future of Star Wars toy manufacturing. The merger is not a sure thing of course, and has been attempted in the past with some resistance by Hasbro employees who created the pin below at the time. Either way, I'm sure the fans will keep them on their toes. We move onto the final few ESB characters, though with 2 bounty hunters and the TIE Fighter pilot we should see some decent pricing. And we are also moving into 'post-The Force Awakens' pricing period. As we all know, we've seen an escalating market post the Disney acquisition of Lucasfilm. Now that the film has delivered, it will be interesting to see where the market now heads. Data collected for this watch includes sales post 17 December. I've been wanting to include some Facebook sales in this update, and this month we have some, following Ross Barr's 'Above Average Sized Pick' sales threads. With TIE Fighters and pilots relatively prominent in TFA, I would assume we'll see a step up in pricing in these items, but only time will tell. As an overall summary, we again see some high pricing for graded items (particularly the AFA85 item), but we do see a decent drop off to much more affordable items for the budget conscious collector. 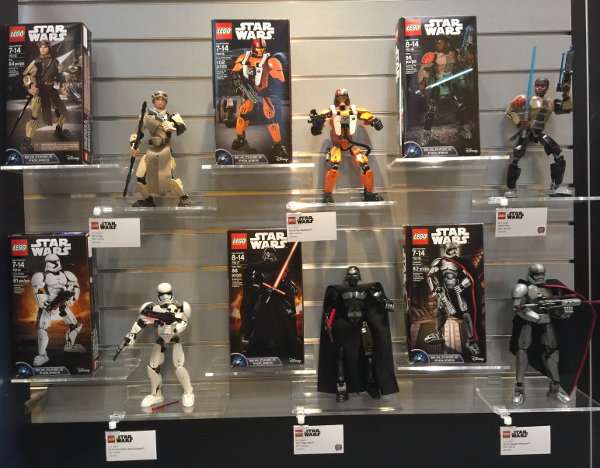 2016 will be interesting as the hype from TFA subsides (though perhaps not too much) and we see where collectors are. A robust US economy also helps to keep the market where it is (and potentially higher) and conditions seem conducive to this continuing for the year ahead. 47 Back Ungraded (with POP removed) - $95. The above examples highlight that whilst the market continues to climb there are decent options out there for those on a budget. Any item graded at an 85 continues to climb, and seeing well over $1k didn't shock me at all, given what we've seen. For my money, the ungraded example was pretty decent and for over $1k less, certainly $ for $ a much better option. 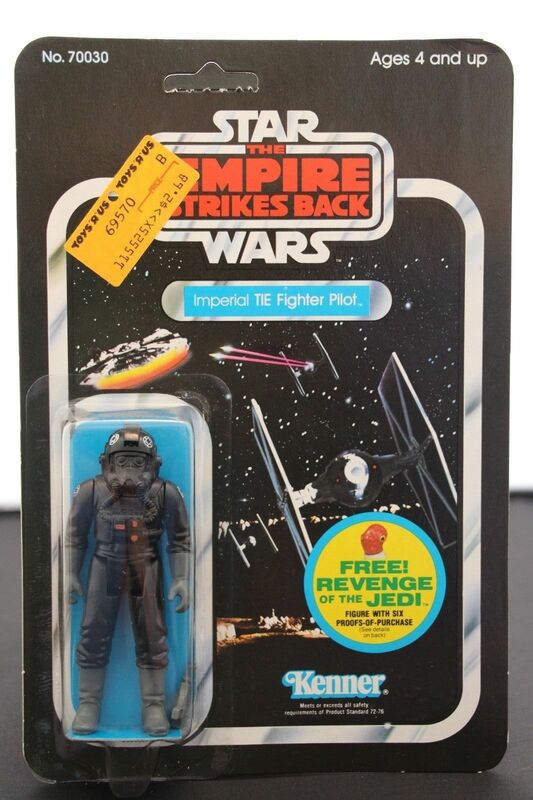 Those searching for offerless cards only have one shot with the TIE Fighter Pilot - the 48A. One graded example sold...and fetched a decent price. Though as the second example shows, if you're prepared to sacrifice quality you can still have a very affordable option. 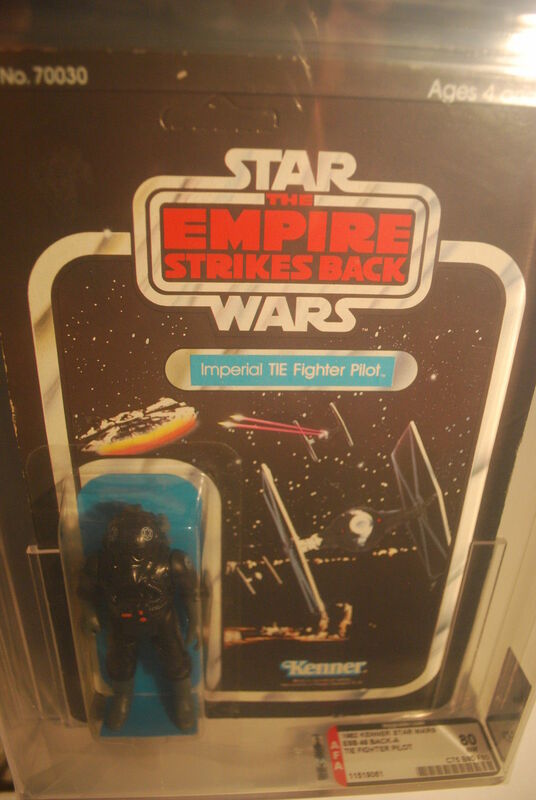 There were a few boxed TIE Fighters selling during the period. This is certainly the pick of them. Guest blogger and long-time Australian collector Ben Sheehan reflects on the vintage collecting landscape in the land down under in the 1990s and now, as well as his discovery of the Archive and how it influenced him. If you've heard the recent 'Chive Cast (Episode 70) heralding Stephen J. Sansweet’s 1992 tome Star Wars: From Concept to Screen to Collectible, you’d know how directly the publication influenced collectors in the early to mid 90s. Names like Gus Lopez, Ron Salvatore, John Wooten, and Chris Georgoulias have frequently cited it as key to the evolution of their collecting habits. This got me thinking about media and collecting culture -- mainly because the book wasn’t a huge hit in Australia (to the point that it was actually quite difficult to track a copy down even years after its release). What that says about Australian collectors, I don't know exactly. 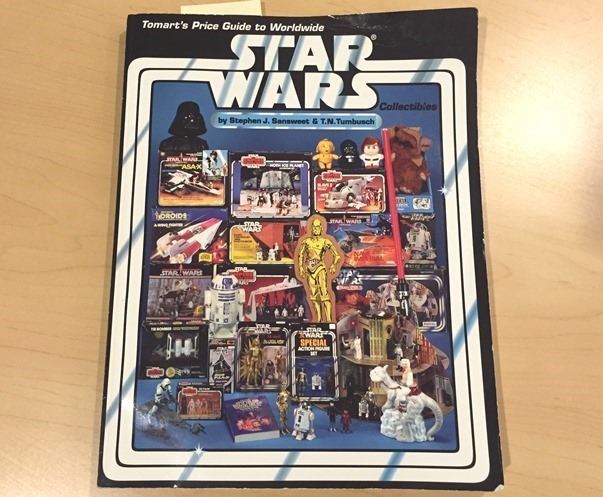 But it was another Sansweet release -- 1994’s Tomart's Price Guide to Worldwide Star Wars Collectibles, that was hugely influential on Star Wars collecting and collectors down under at this time. Same Steve, different book, similar result. Somehow the Tomart’s Price Guide managed to capture the zeitgeist of the pre-POTF2 era down under, almost to the point it became part of Aussie collecting's DNA. 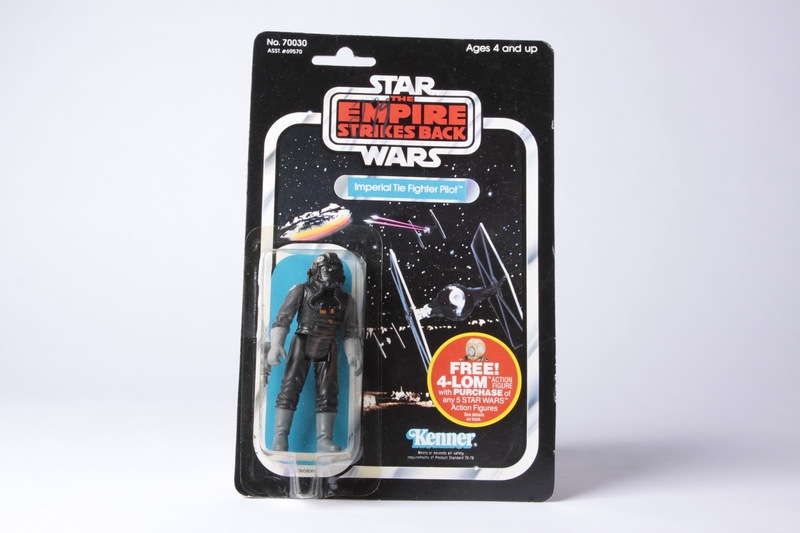 Through it, Sansweet's name became positively synonymous with all things vintage Star Wars. Collectors routinely carried around a heavily annotated, dog-eared copy to toy shows, other collectors' houses, or on buying expeditions. Hours, if not days were spent gazing at each page, each detail -- and almost as importantly, each price. 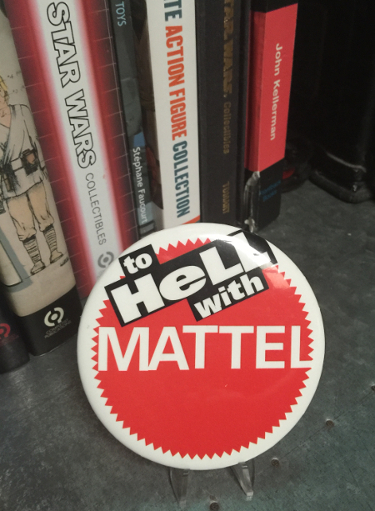 In 1997 I saw an elderly woman clutching a copy as she bought vintage toys for "her son" during a convention (attended by the indefatigable Sansweet, no less). 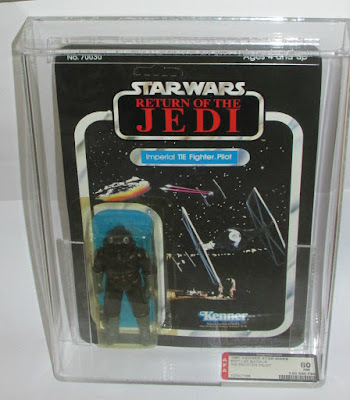 Maybe it was the presence of the huge volume of carded figure overstock in circulation as the result of the Hong Kong warehouse clean outs in the late 1980s, or the readily available cases of POTF figures imported via the docks in Singapore. But prior to the book, no one really knew how these items should be priced. In the early to mid 90s, Australia had a marketplace like the prototype world of today: every purchase was a step into the unknown. Should we pay the same for a POTF Yak Face as they did overseas -- or should we pay even more, or perhaps much less? What if an item was common here, but rare abroad (as was the case with figures such as POTF Anakin, Nikto, AT-AT Driver, and Gamorrean Guard)? 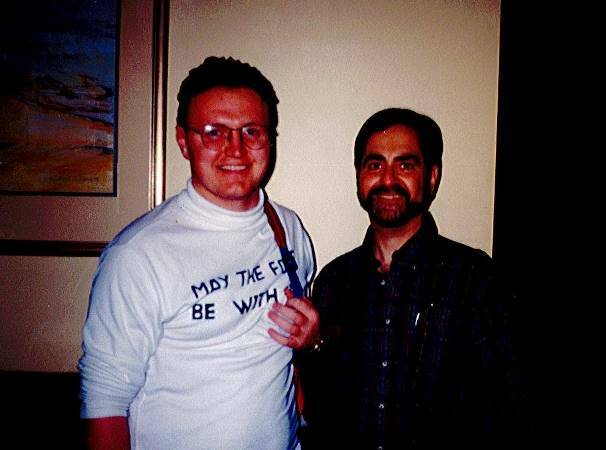 Sansweet with collector Paul Naylor at Australia's Force 1 Convention in 1995, was hugely influential on collectors in Australia. Those were real questions collectors needed to ask themselves in what was a tiny fishbowl of a marketplace, saturated with vintage product. Sansweet and Tomart not only provided prices, they had created a framework for collecting with their book, and it was almost universally accepted. Figure you didn’t want to buy dog food packaging with a Star Wars promotion on it? Well, actually, yes you did. The Harper’s Dog Chow sticker items were in the book, and repeat readings tended to create an interest in the more peripheral collectibles to the point they soon factored into your next want list. Just ask Aussie food licensing fiend Paul Naylor. You also needed a vinyl caped Jawa, and you needed at least one of everything. The book was a check-list, and it seemed very natural to follow it. Better still, it allowed you to identify items that were outside the parameters of normal collecting. 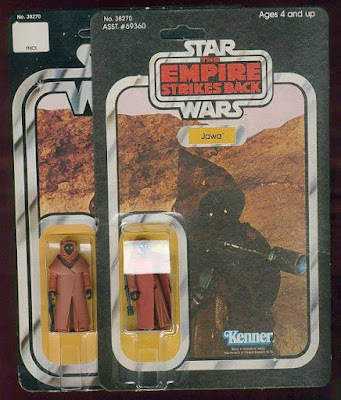 The lack of an ESB vinyl cape Jawa in the book meant that owning one sold locally had a rare caché attached. Ergo other items released by the local distributor Toltoys. The ESB vinyl cape Jawa has yet to appear in any book. Which brings me to the Star Wars Collector’s Archive itself -- the ultimate influencer for collectors in the mid to late 1990s. I discovered the Archive sometime in '94, and the event roughly coincided with a 22 year-old version of me discovering the net at a computer lab under the Deakin University theatre. One Netscape Navigator search for "Star Wars" later, and I’m looking at this Archive thing. There was a lot on it that I didn’t understand. Most of it, even. What was a hardcopy? What was a sculpt, or a proof card, or concept artwork? And who was even interested in concept artwork, when you could look at a 21 back Fett? Why would you want a prototype of a production figure? Sure I wanted a Blockade Runner, but who needed a hardcopy Greedo? For a long time it seemed like I was the only one in Australia wanting to know the answers to those questions too. I (very) slowly began piecing together what I saw in Toy Shop, Sansweet’s’ first book, and what I was reading on the Archive to discover that not only did I like all of it, I actually wanted all of it. On the other side of Australia, coin collecting author Mark Salotti was doing the same thing at an even more advanced pace -- he had found UseNet, via better access to an internet connection. Literally down the road from me in the same city, collector Anthony Woolley was doing the same thing. Elsewhere, in complete isolation, perhaps hundreds of other Austalian collectors were beginning a similar path via Sansweet’s book. As the Archive evolved, John Wooten became incredibly influential on me. His constantly evolving Stormtrooper proof card run/Archive entry seemed to need to be monitored regularly. It rewrote my want list of proofs on what seemed like a regular basis. 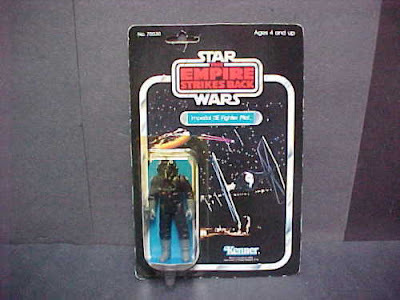 Archive updates, which were often almost as scarce as the toys featured in them, were highly anticipated. In non chronological order: I watched Ron Salvatore begin to piece together his acetate Leia Hoth sculpt. I saw Steve Denny’s entire set of POTF proof cards for sale at a cool 50 grand (then disappear, as though someone had bought them). 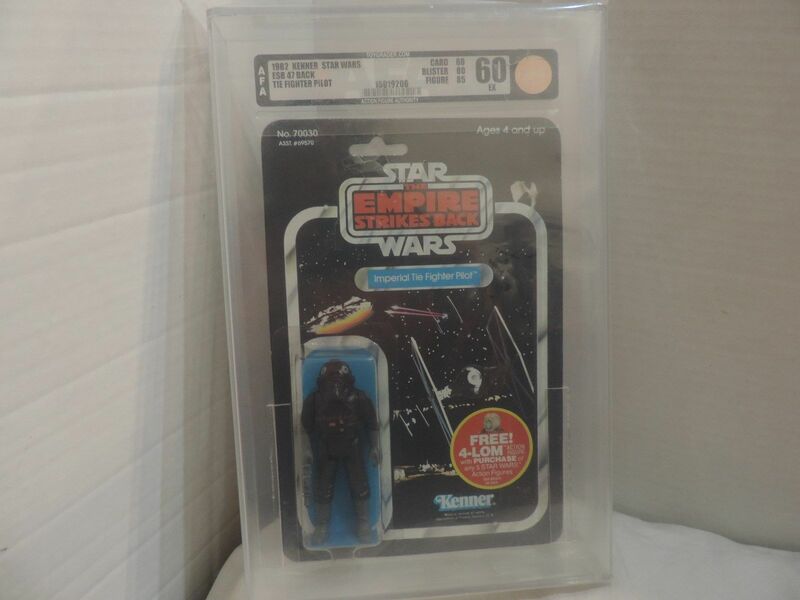 I read to be wary of people trying to scam collectors with everything from Blue Harvest pieces, fake vinyl cape Jawa bubbles to "unproduced" POTF era pieces. I found out that Brennan Swain used to ride vert on his BMX (OK, not SW related, but still significant to me). The fact that every item featured on the Archive was entirely unobtainable, or at least seemed that way, protected my bank account for a long time (as did the absence of eBay). But when Tom Derby began to broker Steve Denny’s collection of proofs and prototypes, and The Earth began to sell off a large collection of hardcopies in the late 1990s, I was suddenly buying items that I’d previously thought were objects to be written about and featured (on the Archive) exclusively -- not something you could actually own. Prior to this, I’d wanted the stuff, but my phone calls to the numbers in Toy Shop ads were always too late (the magazine was weeks old by the time I saw it), or the source too dubious. If I’d bothered to check UseNet, things might have been very different. Then along came the Archive forums and chat, and suddenly I was seeking advice from Chris and Ron (where previously it had been only the patient Gus’ email account that I bombarded with questions). Through these guys, the Archive was a sounding board to bounce ideas off, as well as a collecting encyclopedia. Media has evolved a lot during the last ten years in particular. Our hobby has changed quickly as a result -- moving from mass to mess media, with the arrival of several thousand dedicated Facebook groups, more collector publications than you can shake a stick at, and an even greater influx of new blood. In the mid 1990s, I was as active in the hobby as I am today, and used to know of around ten or so other Aussie guys. There were 2,464 members of Australian Vintage Star Wars Action Figures & Toys (1977-1985) group alone, last time I checked. Granted not all of these members are located in Australia, but a good deal are. It's no longer just a handful of books or a single website with one reasonably reliable forum for exchanging information that informs the hobby. I don't seek advice from the hobby's pioneers nearly as often as I used to either. But the building blocks of knowledge that Sansweet’s book and the Archive provided, and lessons from the guys behind it, remain as relevant to me as they always have been. I don't think it's a stretch either, to predict that this older media will continue to influence newer Australian (and international) collectors, as it's eventually discovered by them, just as it has been by thousands of others for over two decades now. What do you reckon is the most obscure American Star Wars product released by Kenner? I'm not talking about a variation, a promotional item, or a release by a non-U.S. licensee, but a distinct American product. My vote goes to the battery-powered toothbrush, specifically the versions released in conjunction with The Empire Strikes Back and Return of the Jedi. 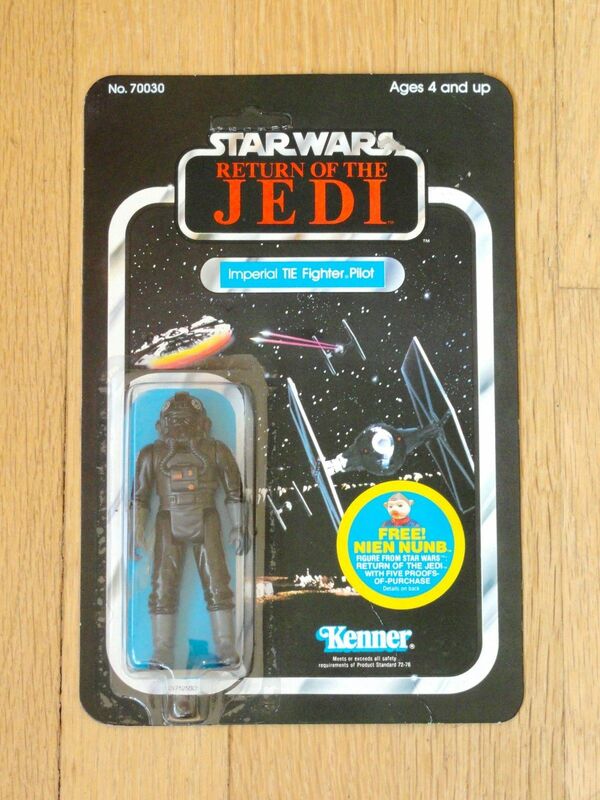 Undoubtedly, many collectors are familiar with the original version of the item, which Kenner issued as part of its early range of Star Wars product in 1978. 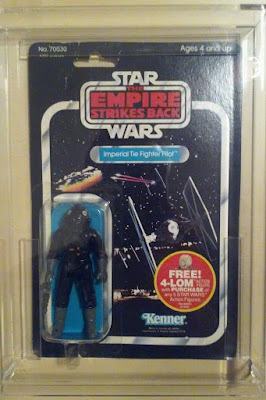 But did you know that an Empire Strikes Back version was released on card? Or that JCPenney offered an exclusive Return of the Jedi version to its mail-order customers? 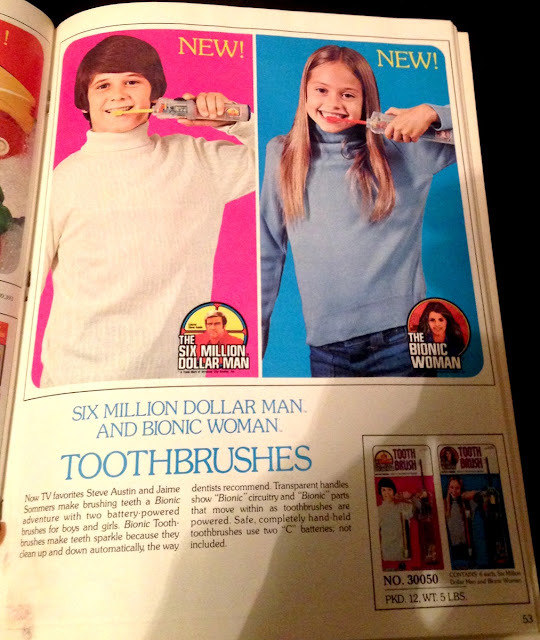 The base product, irrespective of its logo and graphics, was a reworking of the Six Million Dollar Man and Bionic Woman toothbrushes, released in the mid-'70s. 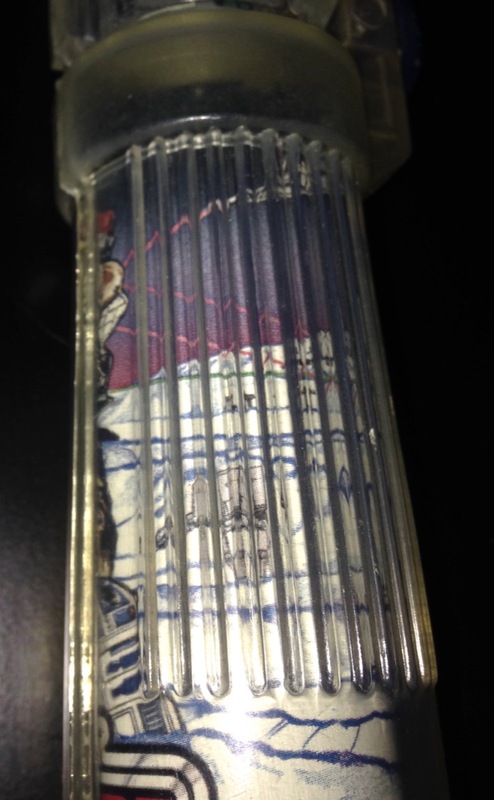 Like its Bionic counterparts, the Star Wars version utilized a clear plastic housing through which colorful graphics were visible. 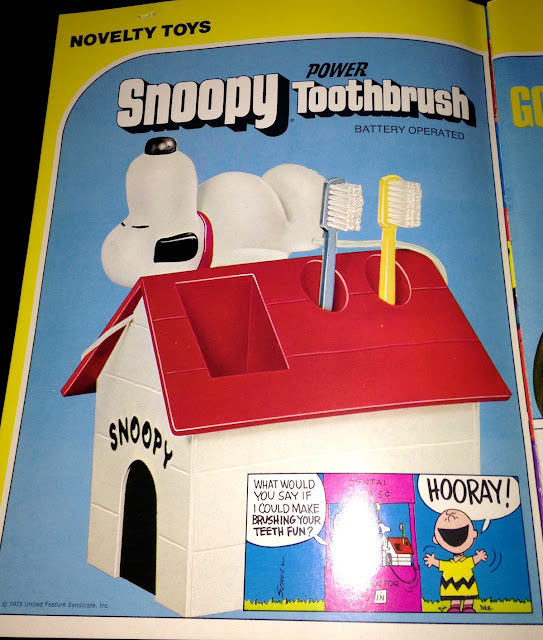 But Kenner's association with battery-powered toothbrushes actually goes back to 1972, when the company introduced a teeth-cleaning apparatus in association with a license concerning the Snoopy character. The Snoopy Power Toothbrush must have been a hit for Kenner, as it's the first item featured in the company's 1973 Toy Fair catalog. 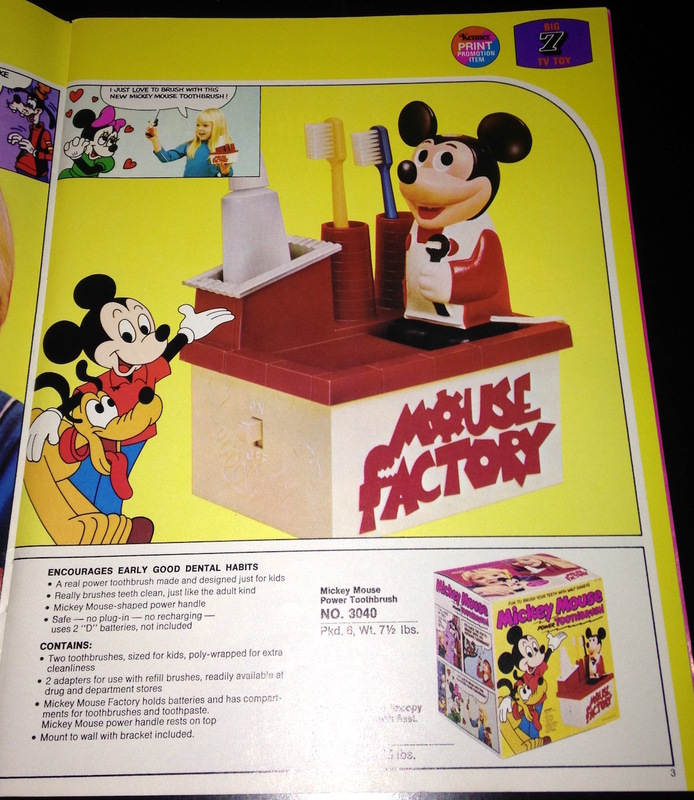 And it was quickly followed by similar products based on Mickey Mouse and The Flintstones. Although the forms of these earlier toothbrushes differed from the Bionic and Star Wars versions in that their batteries were housed in a separate casing, to which the handle attached via a power cable, the focus on licensing and the multi-colored brush attachments clearly identify them as predecessors of the later products. 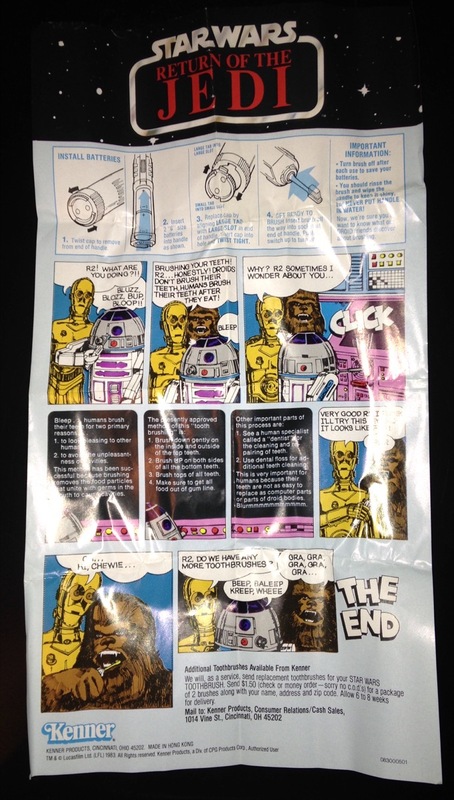 It's also worth mentioning that the packaging for these products featured comics-style panels showing kids talking to the fictional characters. You'll want to recall this fact when I discuss the reverse of the blister card on which the Star Wars toothbrush came packaged. 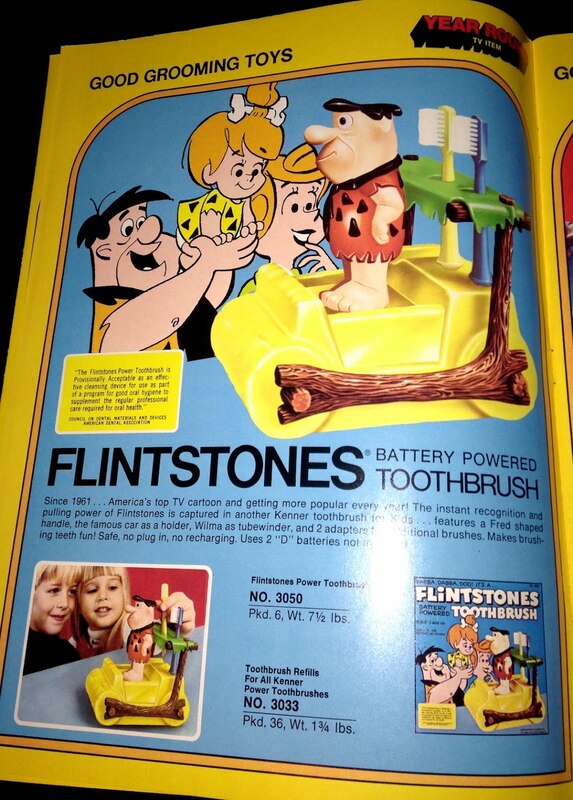 Still, it seems to me that a proper Flintstones toothbrush should look like a hedgehog strapped to a small dinosaur bone. Anything less is a betrayal of the show's aesthetic. 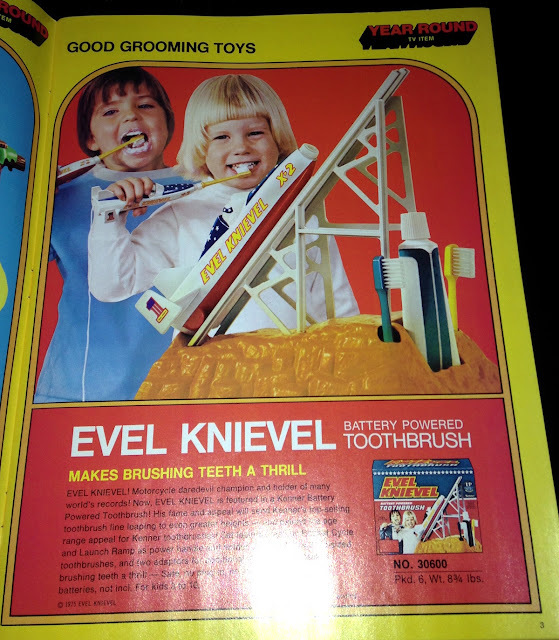 But my favorite of these pre-Bionic products is the Evel Knievel Battery Powered Toothbrush, which featured a battery casing formed in the likeness of rocky terrain and a handle mimicking Evel's infamous Skycycle X-2. Now, like most people of refinement and taste, I know a thing or two about Evel Knievel -- and one of the things I know is that the Skycyle crashed while Evel attempted to traverse the Snake River Canyon in 1974. Knievel, like any great American, went down with his ship, nearly dying in the process. Kids, let this be a lesson: In order to brush your teeth, you must have teeth. Anyway, by the time 1978 rolled around, the folks at Kenner were experienced uniters of battery-powered toothbrushes and popular licenses. 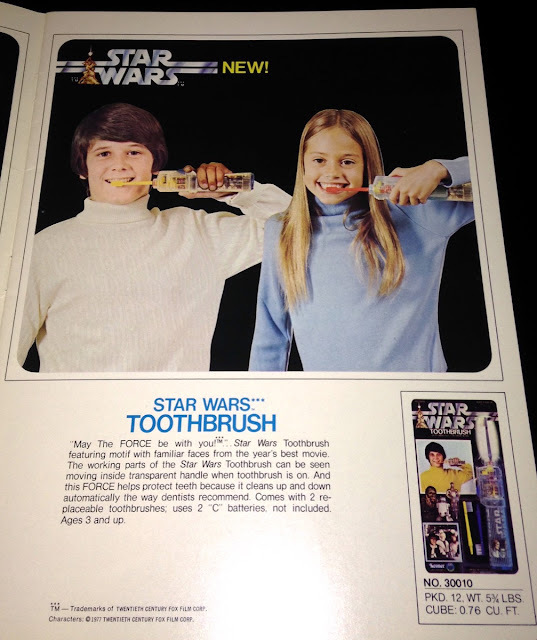 And since the Bionic toothbrushes had been introduced a mere two years earlier, it was natural for the company to recycle the product into the Star Wars line. 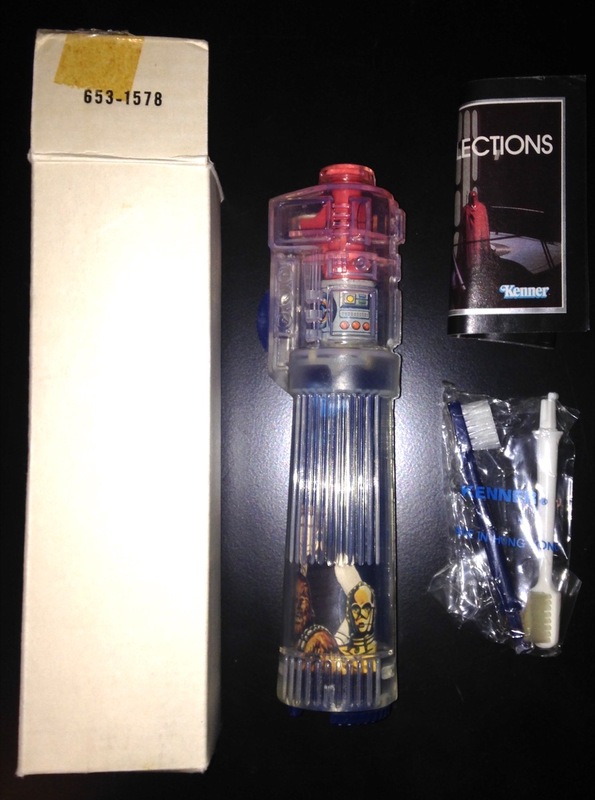 To update it, they simply changed the graphical insert housed within the clear plastic handle. In some ways the Star Wars Toothbrush was even more amenable to its license than were the Bionic toothbrushes to theirs. With a little imagination, the two brush attachments could be taken as lightsaber beams. 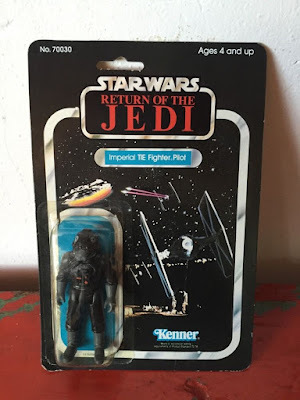 To that end, Kenner molded the implements in blue and yellow plastic, thereby causing them to echo the lightsaber accessories included with their Ben Kenobi and Luke Skywalker action figures. Interestingly, the Japanese version of the product, released by Takara, featured a red brush attachment, possibly in emulation of Darth Vader's lightsaber. It's said that Vader was more machine than man. But when it came to brushing his teeth, he was alllll machine, baby. The back of the product's blister card is -- or should be -- legendary. 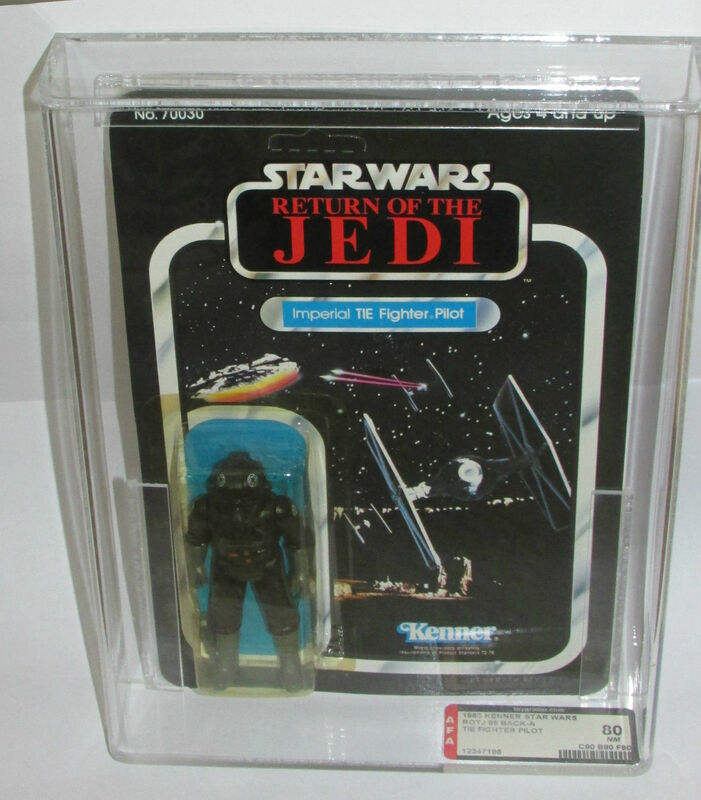 It features comics-style panels similar to those found on the boxes of Kenner's earlier toothbrushes. But in this instance the featured characters are drawn from the Star Wars universe. Chewbacca makes a rather ignominious appearance. Why the heck is he wearing the same expression in every panel in which he's featured? And what's with all his droid bullying? Hey, Chewbacca: Threatening to pull C-3PO's arms out of their sockets was bad enough. Don't you even think of sticking his toothbrush into your nasty Wookiee mouth. 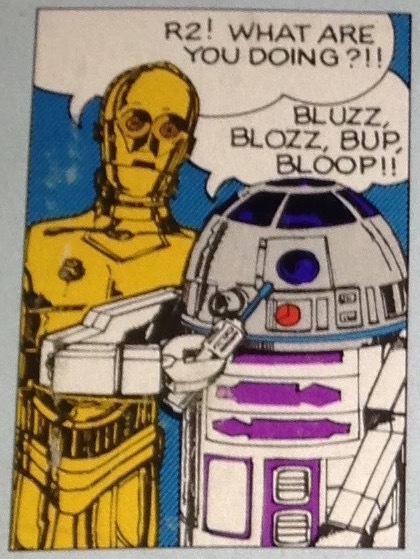 Of course, droids, being without teeth, have no need of toothbrushes. But when R2-D2 is depicted with a forearm and grasping claw-hand, we've clearly exceeded the limits of sense and rationality. 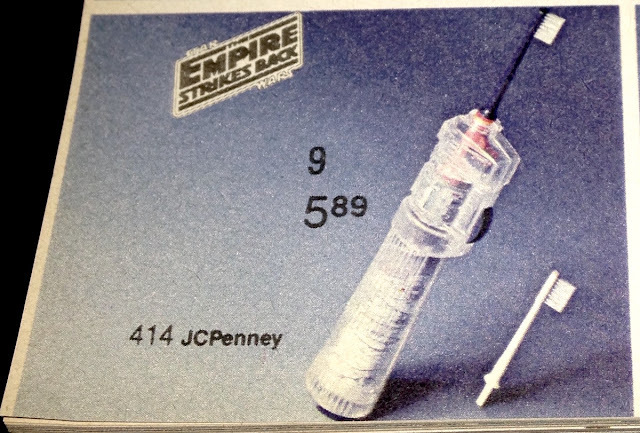 The Star Wars Toothbrush was also available via JCPenney's Christmas catalog, a popular shopping tool of the era. 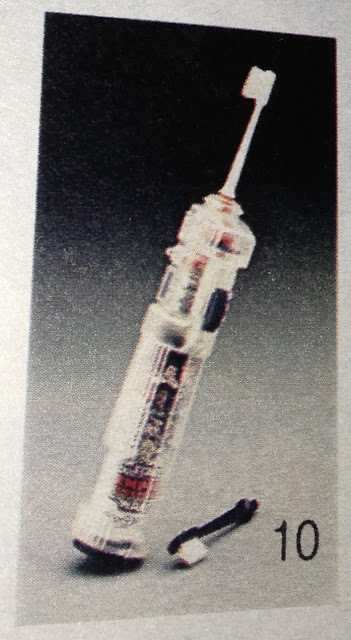 The above photo shows the manner in which the product was presented in the catalog. The large "Star Wars" logo leaves no doubt about its relationship to the most popular movie of the period. "Turn on the 11-in. plastic toothbrush and watch it work." Not the zestiest line of advertising copy ever written, but I suppose it'll suffice. In 1980, Kenner updated the product with Empire Strikes Back graphics and packaging. The piece of plastic inside the upper portion of the casing was changed from yellow to orange, and the brushes were molded in white and dark blue rather than blue and yellow. But in most respects it resembled its predecessor. 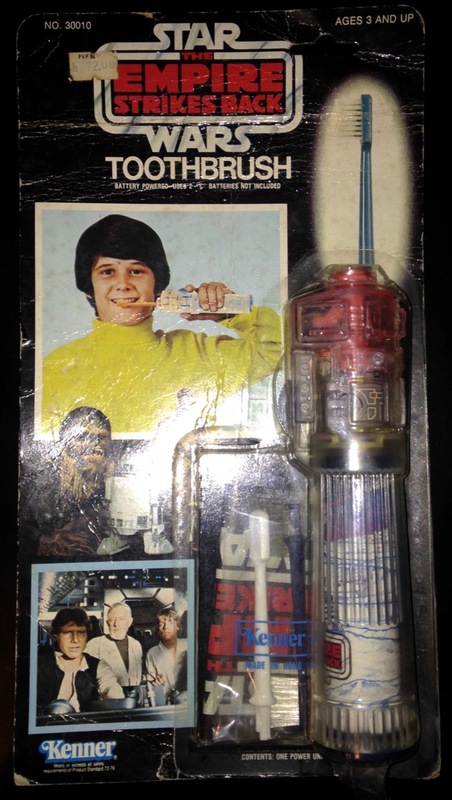 In my experience, the carded ESB toothbrush is one of the rarest Kenner Star Wars items -- much rarer than the TIE Bomber or large-size IG-88. 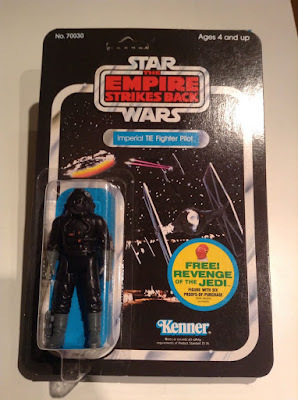 Though rare in carded form, the Empire version of the product could once again be obtained through the JCPenney catalog, in which it was featured during the Christmas season of 1980. In fact, for many years I assumed this item was exclusive to JCPenney, as I was not aware of the packaged version. In the two years following its initial appearance in the JCPenney catalog, the price of the toothbrush jumped from $5.33 to $5.89. can see, the graphics featured a multitude of Star Wars characters -- some of them possessing actual teeth. Upon opening the box, the first thing you did, after feeling angry that Santa didn't bring you something cooler, was read the wacky comic. It was printed in black and white on a separate flyer. Just think, had Kenner opted to forgo the comic when putting together the mail-away version of the product, the child of 1980 would have missed out on the spectacle of claw-hand R2 incongruously poking his dome with a lame Christmas present. Here's another look at the graphics set inside the cylindrical case of the toothbrush. I'm sorry to do this to you, but here I must digress. As a fan of Cervantes and Melville, I love digressions. Take a look at the artwork discussed here and here, and note how similar it is to the Hoth-inspired background depicted in the scene featured on the ESB toothbrush. Weird, right? Though the arrangements of the AT-ATs and Snowspeeders differ between the two compositions, it's clear they're connected in some way. I only noticed this now, while putting together this blog post. Okay, so it wasn't much of a digression. Maybe it wasn't even interesting. Look, you're not paying for this, right? This is what they call "free entertainment," yes? If you're not satisfied, StarWars.com is just a click away. It's the source for all of your nerdlinger needs. They even have recipes for Poe Dameron Pie. Poe Dameron Pie: Eat it with someone who loves you. And then stops loving you, because you made Poe Dameron Pie. In 1983, upon the release of Return of the Jedi, Kenner was ready with a third iteration of their Star Wars toothbrush. The brush attachments remained blue and white. The graphics show the second Death Star and the main human characters, all of them wearing ROTJ-specific garb. 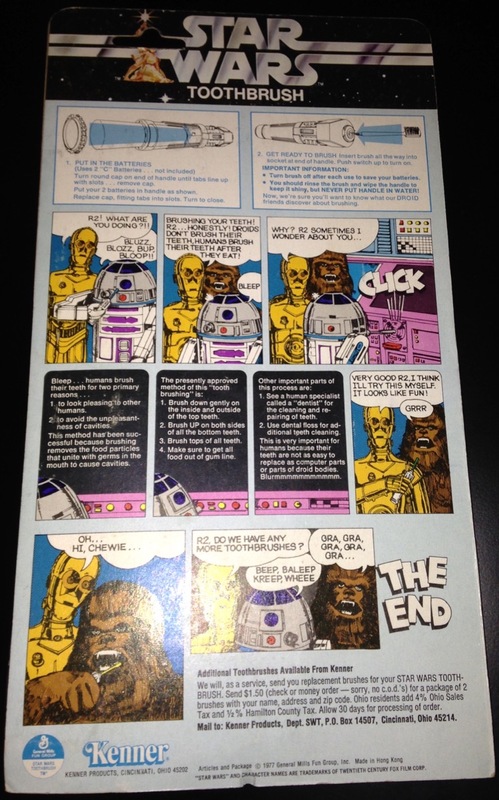 This time around, the included flyer was printed in color, but aside from the presence of the ROTJ logo, it was identical to the previous version, right down to Chewbacca's weirdly poetic "GRA, GRA, GRA, GRA, GRA...."
This version was obtainable solely through the JCPenney catalog. It was a JCP exclusive, and no carded version exists. For an exclusive product, it's woefully underrepresented in the catalog, being advertised via a small, drab-looking photograph. 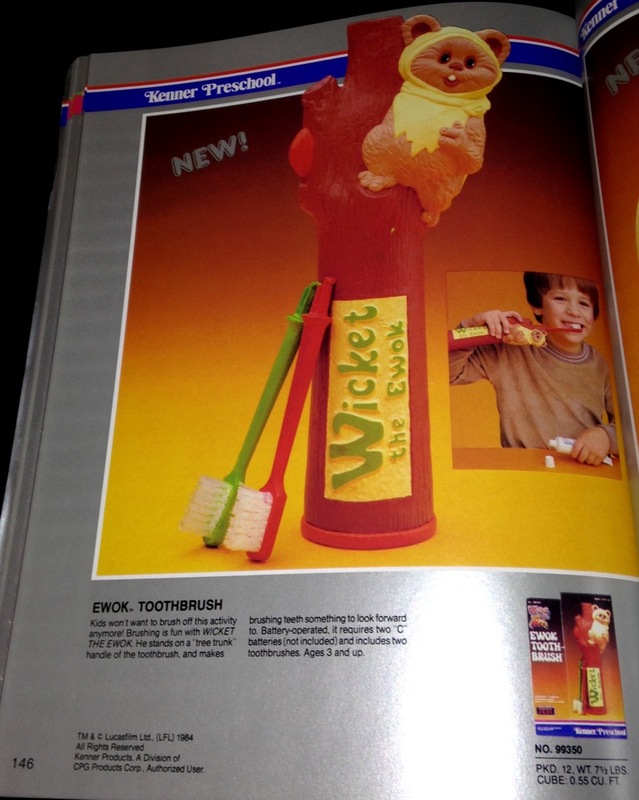 The catalog photos for the previous versions of the toothbrush featured the logos of the movies with which they were associated. 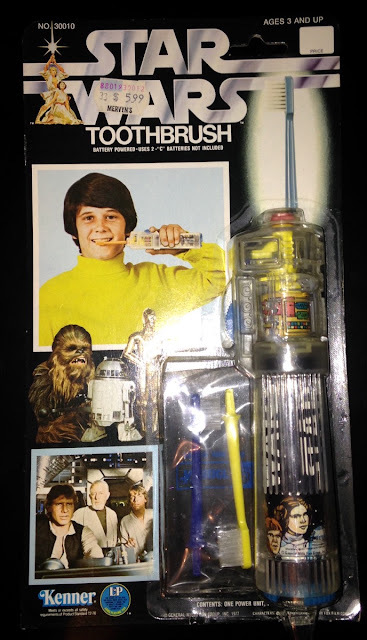 But there's no logo featured on the photo of the ROTJ toothbrush. In fact, there isn't even a ROTJ toothbrush: that's the ESB model you see pictured there. Without a good photo or a logo to draw the reader's attention, I think it's likely that most folks glanced right over this without realizing what they were looking at. Even the lame-o advertising copy is gone. Yet the price still increased: The cost of brushing your teeth with the Force now exceeded $6. 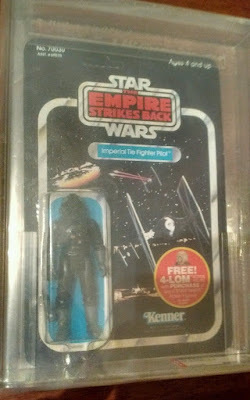 Kenner's commitment to Star Wars dental products didn't end with the departure from theaters of the Star Wars franchise. 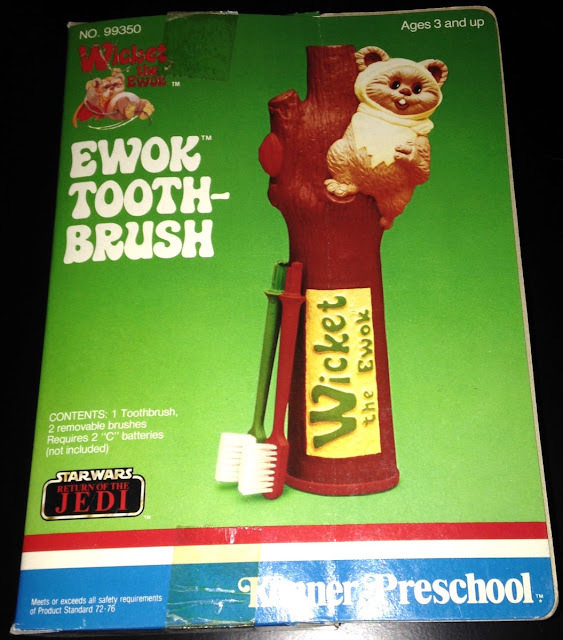 In 1984, the company produced the Ewok Toothbrush. The product was released as part of Kenner's preschool line, a bold attempt by the company to make headway in a market predicated on the tastes of people who haven't yet learned to use the toilet. 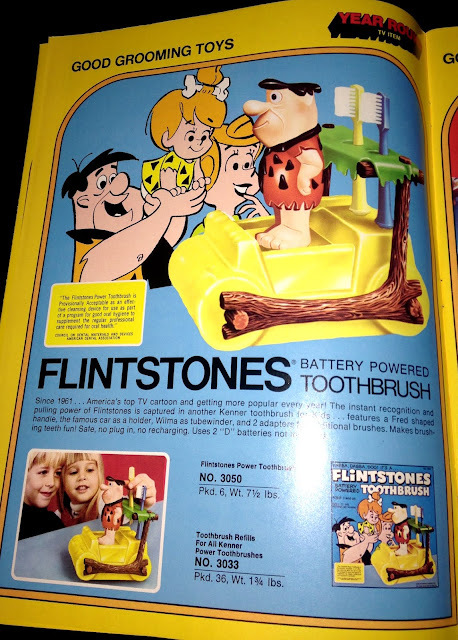 Earlier I lamented the fact that the Flintstones toothbrush wasn't formed in the likeness of a hedgehog strapped to a bone. 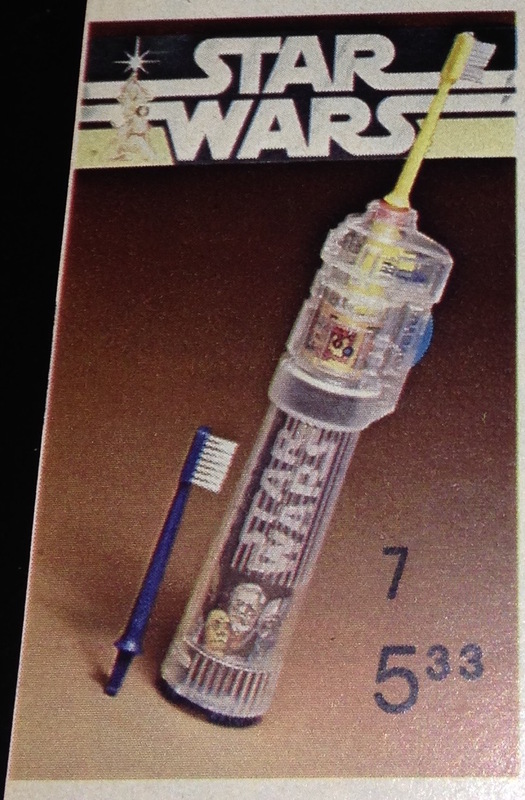 Well, the Ewok Toothbrush, with its rustic shape and figural emphasis, almost made up for that deficiency. Among other things, it allowed kids to drool their nasty mouth ooze all over Wicket's adorable head. Here ends our look at Kenner's Star Wars toothbrushes. Use them to clean your teeth after every serving of Poe Dameron Pie. Thanks to Yehuda Kleinman for supplying a couple of photos.